For every pound of California Refund Value (CRV) aluminum cans recycled, receive a special redemption value of $1.68 per pound. There is a CRV limit of 100 pounds per day. 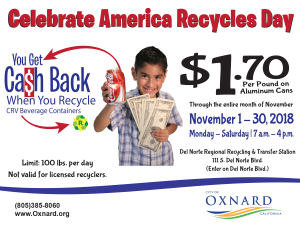 Celebrate America Recycles Day with the City of Oxnard all month long, during the month of November. 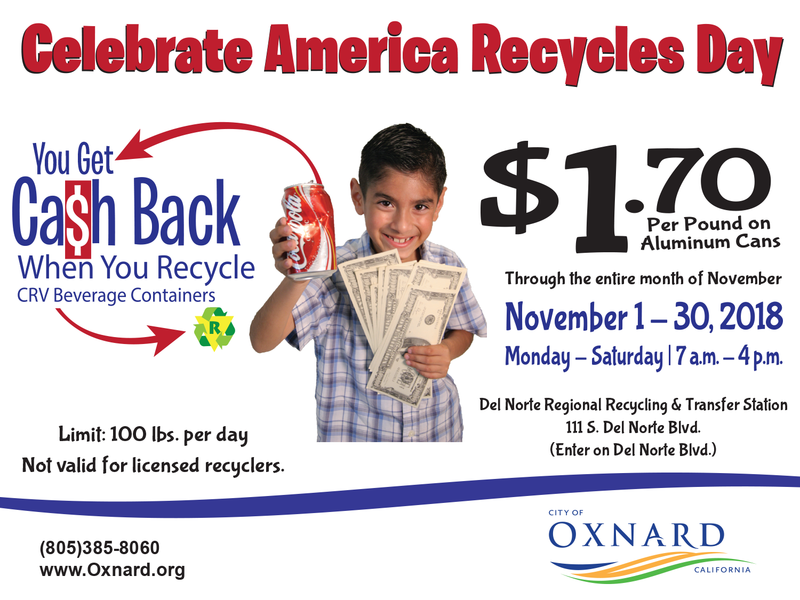 Stop by and recycle those aluminum cans and get cash back. For every pound of California Refund Value (CRV) aluminum cans recycled, attendees will receive a special redemption value of $1.70 per pound. There is a CRV limit of 100 pounds per day. This offer is not valid for licensed recyclers. The Del Norte Regional Recycling and Transfer Station Buy Back Center is located at 111 S. Del Norte Boulevard and is open Monday through Saturday from 7 a.m. to 4 p.m..
America Recycles Day is the only nationally recognized day dedicated to encouraging Americans to reduce, reuse, recycle, and buy recycled products. To support this effort, the City of Oxnard event aims to raise awareness of ways to save energy and conserve natural resources. Oxnard, California – The City of Oxnard has established a Channel Harbor Response team and a hotline for residents to report odors or discoloration of water in the Channel Islands Harbor area. “There are a lot of unknowns at this time, but the city is taking the matter seriously and taking immediate action to determine the cause,” said Oxnard Mayor Tim Flynn. On June 18, within 24 hours of receiving a call, the city collected water samples at five locations in the Channel Islands Harbor and Edison Canal area; results are expected within a week. The city was also out today taking samples at various locations during low tide. Additional samples will be taken later today during high tide. Oxnard, California – La ciudad de Oxnard ha establecido un equipo de respuesta de Channel Harbor y una línea directa para que los residentes reporten olores o decoloración del agua en el área del puerto del canal Channel Islands. “hay un montón de razones desconocidas en este momento, pero la ciudad está tomando el asunto seriamente y tomando medidas inmediatas para determinar la causa”, dijo el alcalde de Oxnard, Tim Flynn. Bert Perelló, miembro del Consejo de Oxnard, agregó: “mi máxima prioridad, y la máxima prioridad de la ciudad, es la salud, la seguridad y el bienestar de los residentes de Oxnard”. El 18 de junio, en el plazo de 24 horas de recibir una llamada, la ciudad recogió muestras del agua en cinco localizaciones en Puerto del canal de Channel Islands y área del canal de Edison; los resultados se esperan dentro de una semana. Las muestras fueron tomadas en la ensenada del puerto del canal Channel Islands, a lo largo del sur del puerto Harbor Boulevard; cerca del puente West Channel Islands Boulevard; a lo largo de West Hemlock Street; el canal de Edison cerca del colector de basura de Edison; y cerca del puente West Fifth Street. La ciudad también salió hoy tomando muestras en varios lugares durante la marea baja. Las muestras adicionales se tomarán más tarde hoy durante la marea alta. Oxnard, California – The Thomas Fire continues to burn in numerous areas of Ventura County. At this time there is no active fire or threat to the City of Oxnard. Resources from the Oxnard Fire and Police Departments continue to assist with the response, and city officials are closely monitoring the spread of the fire. Sporadic power outages continue throughout the region due to fire and wind conditions. Additionally, numerous roads and highways are closed in and around the fire areas including intermittent closures of Highway 150, Highway 33 and US 101 north of the City of Ventura. As the winds shift throughout the day, residents can expect that smoke conditions in Oxnard can range from light to heavy. During smoky conditions, residents are advised to limit their physical activity and stay indoors with windows and doors closed as much as possible. Running air conditioning units can also help reduce smoke levels indoors. The use of dust masks (particulate respirators) and eye protection may help reduce these effects but may not be effective for everyone. If you or a family member are experiencing severe or prolonged distress, you should consider temporarily moving out of the area and contacting your doctor. High winds and “Red Flag” fire conditions are expected to continue throughout the weekend. Residents are asked to use extreme caution when driving and be aware of hazards such as malfunctioning traffic signals, blowing dust, responding emergency vehicles, downed trees, branches and powerlines. For updated information go to: www.readyventuracounty.org . In honor of Women’s History Month, the Oxnard Public Library will host “Sam the Piano Man” who will talk about women composers during the ragtime era. We often hear about the men, such as Scott Joplin, Joseph Lamb, and James Scott, but we seldom hear about the women. Sam Hobel is a pianist, a freelance writer, and an American music history consultant. He will discuss how in the past, male ragtime composers received more attention than their female counterparts; in fact, women were often excluded from this profession. He will acquaint us with who these composers were, how they lived, and why they didn’t become as famous as their male counterparts. After the informal lecture, Hobel will delight the audience with “A Ragtime Suite from the Other Wing,” which is a suite he compiled containing excerpts from 12 different ragtime pieces from 11 female composers. This presentation is free and will take place on Tuesday, March 15, at 4:00 p.m., at the Oxnard Public Main Library in meeting room B. For further information, please call (805) 385-7532. The City is seeking community input on phase 1 of La Colonia Neighborhood Street Resurfacing Improvement Project. The City will host a meeting on February 4, 2016 at the Cesar Chavez Elementary School Cafeteria, 224 North Juanita Avenue, from 6:30 PM-8:30 PM, to discuss and prioritize street, sidewalk, curb and utility improvements. “This is an opportunity for La Colonia residents and businesses to look at various options and give the City feedback on their priorities,” said Dan Rydberg, Public Works Director. Some street resurfacing project options include improvements on: streets, sidewalks, curb ramps and cast iron pipe replacements. Spanish interpretation will be provided at the meeting. For more info, visit CityofOxnard.org or call (805) 385-8280.